Rose O'Neill's saucy little Kewpie became so popular after the first illustrations appeared in 1909 that there was a demand to manufacture commercial items bearing the Kewpie likeness. A market developed for the books, comic strips, lamps, dishes, postcards, figurines, dolls, jewelry and many other kinds of merchandise items. Rose O'Neill would not have been able to produce all the models and samples that mass merchandising would require. One of the first distributors to show an interest in the Kewpie properties was Geo. Borgfeldt & Co. In 1881 Geo. Borgfeldt & Co. was formed as a partnership with George Borgfeldt, Marcell Kahle and Joseph L. Kahle. The purpose of the firm was to import from Europe dolls, toys, figurines and novelty items for distribution to the American market. Branch offices were established in New York City, in Canada and all over Europe, particularly in Germany, the center of the doll and toy manufacturing industry. George Borgfeldt resigned as president of the firm in 1900 and was succeeded by Marcell Kahle. After the death of Kahle in 1909, Fred Kolb became president. In 1912 Kolb entered negotiations with Rose O'Neill to produce a variety of Kewpie figurines and dolls. They decided to hire an American assistant to render designs from Rose O'Neill's Drawings of Kewpie. An advertisement for a sculptor was sent to the Fine Arts College of Pratt Institute in Brooklyn and a 17- year- old student Joseph L. Kallus, of Brooklyn, applied for the position and was interviewed by Kolb and O'Neill. Kallus made some rough modeling sketches from O'Neill's drawings and was hired to execute Kewpies for manufacture in Germany. It has always been a practice in the doll industry for a designer (in this case Rose O'Neill ) to initiate the idea for a doll and to establish a rough perimeter of the conceived product and to obtain assistance in the actual modeling and casting of the doll. Then the original designer offers suggestions, changes and approval of the final product. Kallus worked with O'Neill in the designing the first Kewpie Figurines and dolls that were to be produced in bisque in Germany in several factories with which Borgfeldt was affiliated, among them J.D. Kestner, Gebr. Voight and Herman Voigt. Karl Standfuss made celluloid Kewpies and Margaret Steiff made cloth Kewpies. Fred Kolb and Rose O'Neill were delighted with the work that Joseph L. Kallus was completing on the Kewpie project, Kolb also retained Kallus to design other dolls while he continued with his studies at Pratt Institute. "Mr. Kallus brought three Kewpie doll heads to class, and he passed then around and explained the work he was doing on them. This demonstration occurred in the Max Herman illustration class. I did not know at the time of the demonstration that these were Kewpie dolls. I knew only that they were different from the dolls we were used to seeing. They had no hair, but they had a small topknot on a symmetrically round head to depict the caricature of a child, which distinguished them from anything that I had ever seen in dolls. It was not until I saw Kewpie illustrations published in Good Housekeeping Magazine, Ladies' Home Journal (sic) and other periodicals that I came to know that the dolls which Mr. Kallus had demonstrated to the class were the original sculptures of illustrations drawn and originally conceived by Rose O'Neill from which Kewpie dolls were made. My clear recollection is that the doll heads which Mr. Kallus demonstrated to the class at that time were handmade samples in plaster of Paris. Mr. Kallus explained to the instructor (Max Herman ) the work he had done on those heads and asked for comment and criticism. I was quite interested in this incident and have retained a recollection of it over the years. ... To the best of my knowledge and belief, Mr. Kallus and I are the sole surviving students of that class." In 1918 Kallus received the first of many copyrights on his own doll designs. His first character doll was Baby Bundie. That year, at age 24, Kallus attempted to secure an assignment for the war effort. He had several of his instructors at Pratt Institute, among them Frederick T. Baker and O.W. Beck, and Frank Vincent DuMond, an instructor at the Art Students' League of New York (where Kallus had also studied ), submit letters of reference to Charles Dana Gibson, the famous illustrator and creator of the "Gibson Girl," who was Chairman of Pictorial Publicity in New York for the war effort. Instead, Kallus trained for fire observation during World War I. From 1919 to 1921 Kallus was President of the Mutual Doll Co., a firm that made composition Kewpies; Baby Bundie dolls; and Bo- Fair, Dollie and Vanitie, who had specially designed socket joints. 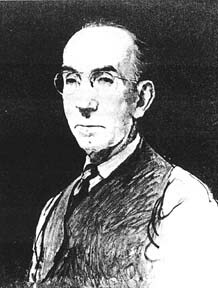 Kallus resigned from Mutual in 1921. In 1922 Kallus established the Cameo Doll Co., which lasted in one form or another until 1982 when Kallus assigned all his properties to Jesco, Inc. Most of the dolls and animals made by Cameo until after World War II were of composition and segmented wood joints. For Borgfeldt Cameo made Kewpies and introduced the Kallus designs Baby Bo Kaye and Little Annie Rooney. Little Annie Rooney was the creation of Jack Collins who wrote and illustrated comic strips for newspapers. Little Annie Rooney was made as an all- bisque figure and as a fully- jointed composition doll. The Cameo Doll Products Company was located in Port Allegheny, Pennsylvania, from 1933 until 1968, when the molds for dolls were taken over by the Strombecker Corporation of Chicago. In October 1934 a fire almost devastated the entire plant during its busiest season. After rebuilding, Cameo also manufactured dolls for other doll companies, who packaged them in boxes with their own company names, most notably the Effanbee Doll Corporation while it was owned by Noma Electric in the late 1940s. In 1933 Kallus was summoned to Washington by President Franklin Roosevelt as a representative of small industrial firms in Pennsylvania. He consulted with the President to suggest the most feasible methods of bringing the depression economy back to normal production. After Rose O'Neill died in 1944, the rights to produce Kewpie, Scootles and Ho- Ho were granted to Joseph Kallus in an indirect manner. Before her death, Rose O'Neill had attempted to transfer the rights for her creations to Kallus. (It has been suggested that there was a romantic relationship between Kallus and O'Neill, but no proof of this assertion has been established. In 1947 all trademark, patent and copyright rights to Kewpie were assigned to Joseph Kallus by John Hugh O'Neill, Rose's nephew and heir. 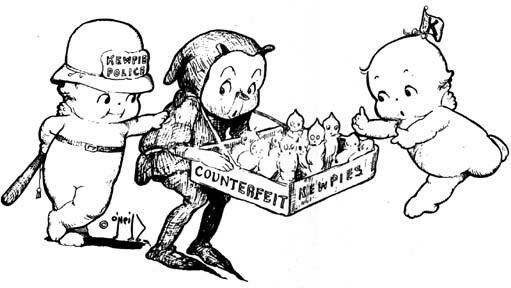 John Hugh O'Neill renewed the copyright for the book Kewpie and the Runaway Baby in 1955 and Kallus later requested from O'Neill's wife that these rights be assigned to him as he wanted "to protect the good will and name of Rose O'Neill and her Kewpie creation." It is not clear at what time Kallus obtained the rights to other O'Neill properties such as Scootles and Ho- Ho, or if any money changed hands for these rights. Mr. Kallus spent a great deal of his energy in his later years licensing the Kewpie designs and entering litigation with various firms to whom he had licensed the right to produce Kewpie and other O'Neill designs. In 1976, at age 83, Kallus suffered a great personal and professional loss when thieves entered his basement in Brooklyn and stole a large amount of original Kewpie models and designs. Patent materials had also been stolen from two safes that were in the basement. The police did not understand the value of these works. Detective Robert Hall of the 67th Precinct said to the New York Times reporter, "The dolls were probably handmade and looked pretty, with pretty clothes." Kallus claimed that many of his original models of Kewpie, the original Scootles, his handmade Joy, his version of Disney's Mickey Mouse, the originals of Howdy Doody, Superman and Pinocchio were also gone forever. Imagine how valuable these models would be today for a collectors' museum! In 1960 Kallus had approached the American Character Doll Co. in an effort to have that firm produce Kewpies under license to Cameo. American Character was not able to deal with Kallus' blunt style after he accused the company of attempting to copy some of his original concepts. He was answered with a curt note: "I have received your letter of the 24th and am now convinced that your unmitigated gall is only surpassed by your insufferable ego." This was during a time period when other doll companies, particularly those in the Orient, were plagiarizing Rose O'Neill and Joseph Kallus Kewpie designs and he was trying to protect the rights that he had gained from the O'Neill estate. In 1969 Strombecker of Chicago began producing Kewpie dolls under license to Kallus and Cameo and encouraged him to permit Hallmark Cards Incorporated to produce greeting cards using Rose O'Neill's artwork because it would help promote interest in Kewpie, which had become more popular than it had been for many years. In 1972 Knickerbocker Toy Co., Inc. approached Kallus for Permission to license any characters that were controlled by Cameo. A contract was awarded to Knickerbocker but Kallus also made an agreement with Kutsuwa Co., Ltd., of Osaka, Japan, to license several Kewpie properties. In 1973 Milton- Bradley, Inc., under the Amsco division of the company, began to manufacture Kewpies in vinyl. Strombecker and Cameo had terminated their licensing agreement in 1973 because Kallus was not granted the privilege of approving all samples of the dolls that Strombecker would produce. This antagonized Joseph Kallus, who wanted to maintain high standards for the Rose O'Neill designs that he owned according to the contact between Cameo and Strombecker. By 1976 Milton- Bradley had severed its association with Joseph Kallus over conflicts in royalty payments and the fact that the company did not mark its doll packages in accordance with its contract with Kallus. Again in 1980 Kallus tried to interest Knickerbocker in the Kewpie dolls, but the company was afraid to deal with him after it was known that he had problems with Strombecker and Milton- Bradley, which were assumed to be more the fault of an aging and irascible Kallus than of the doll companies. By 1980 it was becoming more and more difficult to protect Kewpies copyrights from infringements as unscrupulous individuals were printing Kewpie postcards and other Kewpie likenesses and making dolls that looked like Kewpie and selling these things on an individual basis to collectors. All of this could cause potential problems to those who wanted to manufacture genuine Kewpie Dolls and who wanted to protect their rights and licenses. By the 1980s Joseph Kallus could have sold the rights to Kewpie to any of several major American doll companies who wanted them. He chose Nancy Villasenor of Jesco, Inc. In 1982 Nancy Villasenor, the President of Jesco, met with Joseph Kallus to discuss the Kewpie properties. Villasenor was inspired in this decision by her partner Jim Skahill, the vice president of Jesco. Skahill had a toy import business in California and he imported such dolls lines as Italocrernoma, Migliorati, Corolle, CR Club, and about 20 others. In 1971 he had hired Nancy Villasenor, shortly after she graduated form U.C.L.A., to act as a sales representative to sell dolls from the lines imported from Europe, and dolls from some American companies. While working in the import business Nancy became exposed to many of the "better" dolls, and of all the toy companies that she represented and sold for, dolls became her chief interest. She was convinced by Skahill to begin to manufacture dolls for a company that she would found. In the spring of 1982 Nancy went to New York to meet with Joseph Kallus, then age 89, to discuss licensing arrangements for making Kewpie dolls. Kallus saw in Nancy a person who would do with Kewpie as he had done. He said that he was not interested in making money at his age as he was in continuing the traditions of excellence that had always been associated with Kewpie and with Cameo and he thought that Nancy would do this. Kallus agreed to assign all the rights to Kewpie and all the rights to Cameo design to Nancy Villasenor when he realized that her business goals equaled his: She was committed to developing a business based on quality toys for the quality toy market. After Kallus and Villasenor had concluded the initial part of their business arrangement, he was injured in a traffic accident and died suddenly. Rita Abraham, Kallus' daughter who had no interest in her father's designs, met with Nancy Villasenor when she went to New York to supervise the transportation to California of the original Kewpie and Cameo molds. Mrs. Abraham wanted Nancy to have the 12 trunks of Cameo design dolls, clothing patterns, and Rose O'Neill art work that Mr. Kallus had stored in his apartment, along with many boxes of files and business records. Villasenor's first Kewpies released in 1983, were a re-issue of the 27 inch (68.6cm) Kewpie of 1966; "Yesterday's Kewpie," a 16 inch (40.6cm) dressed in outfits from the past; and "Kewpie Goes...," a 12 inch (30.5cm) series in various theme- oriented clothing designs. The re-issued Kewpie from 1966 for collectors as made by Jesco is slightly smaller than the original version. This is because the older version was made from a stock body and legs, whereas the Kewpie made by Jesco is cast from Kallus' original molds. Nancy Villasenor reported that, "it would have been more cost effective to make new molds, but we were committed to using the original molds as we promised Joseph Kallus." The series of 16 in (40.6cm) Kewpies are modeled after the designs that Cameo issued in 1961. The series of 12 inch (30.5) designs have clothing designed by Shirley Pepys (who is a descendant of Samuel Pepys, whose famous diary was a record of the social and political life of the time when it was published in 1825.) These Kewpies also meet with the objectives of Kallus and Villasenor: "to make Kewpie available for the enjoyment of children and to satisfy the Kewpie hunger of collectors." Nancy Villasenor and Jim Skahill have given up much of their European product import company to concentrate on developing and manufacturing Cameo designs by Joseph Kallus. Their dolls are manufactured in California, from American components. Jesco promised to pursue two directions relating to Cameo dolls, continuing the tradition of Joseph Kallus. Doll design, development and manufacture will expand in both areas. Jesco does not take any short-cuts, such as using cheaper blow-molded doll bodies. Jesco's attitude is that its growth pattern should be for "better dolls," not for "more dolls." Doll collectors and children of all ages are delighted that Kewpie is back again - and back to stay at Jesco.